Professional quality 7-5/8″ diameter for lifetime performance. A dependable strainer that will not rust. 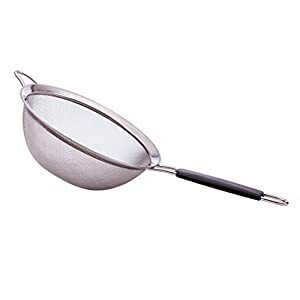 Perfect for any straining or sifting job! Our largest and most versatile strainer for everyday kitchen use. Premium very fine stainless steel mesh colander. This sturdy twilled mesh is tough, pliable, and maintains its form while performing as well as other double-mesh designs in straining the smallest foods; quinoa, rice, soup stock, fruit smoothies and other fine dry ingredients like flour and sugar. Durable stainless steel construction with lifetime warranty. The toughest large strainer available. All welds, and joints are inspected for quality and strength. These strainers will last a lifetime, guaranteed or get your money back!